Lots going on right now, and here are updates on each area. Shiro spawning - very low fertilisation rate, and I've ditched the spawning. I noticed many of the eggs were much smaller than normal but some were at a normal size, and this is something I'll be seeking advice on. Showa spawning - nothing. again! I've tried both showa females twice now, and I'm a bit frustrated that I have nothing to show for it. I'll give them (and me!) 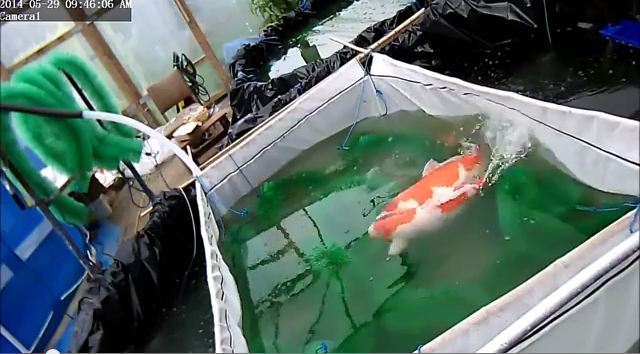 a month off and try them for a late summer spawning - to coincide with first selection on the kohaku #1 fry and there will be an option to bring the keeper kohaku's into the polytunnel, and re-use the fry pond with a new batch of hatchlings. Video link - click here! Water temp was 17 C at this point and by the morning it was 22 C.
I started observing from from 0430 the following morning, and nothing was going on. All I could see was the female stationary, and breathing heavily. The males were breathing normally, so I left them alone until around 0600 at which point I went into the polytunnel and topped up the tank with around 5cm of water. There was no scum on the surface, which is usually a sign that spawning has happened. Back to the PC, and I watched them for a little longer. The female behavior changed, and she looked less stressed and was swimming around normally so I went back to bed for a few hours. But, the spawning motions were infrequent - and only one of the males was partaking. So, I tried something new and took the redundant male out and replaced him with another one. After a little longer, spawning motions started again - and again, very infrequently. but it was all happening with the original male. the newly introduced male was oblivious, and probably just eating eggs. I pulled all 3 of them out just before midday. What I think happened was the majority of spawning may have taken place before 0430. And thereafter, the female was just finishing off! And, waiting until almost midday before pulling the koi out just gave them all time to eat eggs, and introducing the 3rd male also just gave him an extra meal - of eggs!!! There are still plenty of eggs in there, and fertilisation rate looks good - at least 50%. overall then, a success, and all being well I will give this spawning the second fry pond outside and there could be some interesting learning from seeing fry from 2 kohaku spawnings with only the female being different in the parent sets. One slight complication at the time of writing is that I found gill flukes in my females tank 24 hrs after the kohaku spawning. Not many, but some - over 3 slides I found 3 flukes. I considered ditching the kohaku spawning because there will probably be some contamination. I asked my usual go to man (Mark Davis) for some advice, and he suggested either treating the spawning vat with fluke solve - which would be ok to use with the eggs, or just leaving it and keeping a close eye on the fry in the fry pond and treat there if need be. I decided to go for the fluke solve route - and I will keep an eye on things and let you know how it goes. the active ingredient is praziquantel which does not kill gill fluke eggs, but it will kill the live gill flukes and with a bit of luck with do so much damage to the fluke population that they will either be eradicated or will simply not become a problem in the fry pond. if the fluke solve leaves my koi eggs untouched, then I will consider using it more often in the spawning vat. Kohaku #1 fry - in the fry pond outside: these guys are growing well. at 2 and a half weeks in the pond, the largest ones are pushing 2cm already! there's a big disparity between the largest and smallest, and I estimate the average size to be around 1.5cm. We've been feeding most days, once per day from week 1 to week 2m, - just 2 tablespoons of fry food spread around the whole pond. But there's so much natural food in there I'm not too woried about adding additional food and in fact, but more recently we've held off feeding them. A slight concern is I've spotted the odd one swimming in an eratic manner - so I've pulled out half a dozen or so, and looked at them under the microscope. this involved dissecting them so I could understand the health of the whole population. I was hoping to find some parasites - because that would give me a root cause to the odd swimming behavior. But I found nothing. I'm keeping a couple of the odd swimming ones in a large bucket for closer observation. Ofcourse, they've decided to stop swimming funnily now... I should be happy, but my koi keeping senses are telling me to keep a close eye on them. On the upside - there are loads of fry in the pond. And they are growing well. So these are good signs and bodes well for 1st selection which is only a few weeks away.